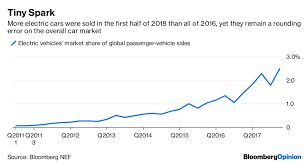 Looking at four major markets — China, Europe, Japan and North America — vehicle sales in the 12 months ending in June increased by about 1.15 million units, year over year. Of that, about 565,000 were electric vehicles. In other words, almost half the growth in the overall car market was taken by the plug-ins. Even at a normalized growth rate for the global vehicle market of 2.5 million units, electric vehicles’ share of that growth would still have shot up to 23%. Electric vehicles, prized for their acceleration, are speeding up. Bloomberg NEF estimates the global electric vehicle market will this week pass the milestone of 4 million sold to date, according to a report published on Thursday. Having taken about five years to get to the first million, the last million were sold in about six months. 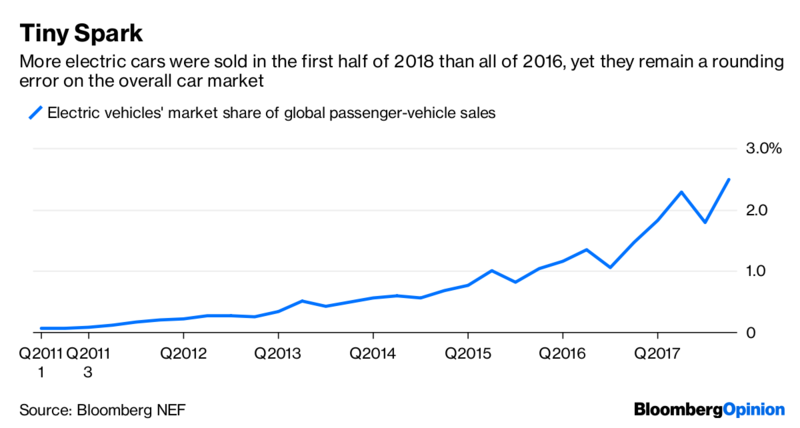 Four million vehicles sold in the space of about seven and a half years doesn’t sound like a lot; mainly because it isn’t: Light-vehicle sales worldwide totaled almost 590 million in that time. But if you aren’t looking at the rate of change, as opposed to just the overall absolute numbers, then you risk being left behind. In any industry, size does matter of course, but growth is also vital. Using a recent example from history, being the biggest mobile-phone maker on the planet is great but doesn’t help if a certain rival changes the game entirely with a new type of smartphone. Growth is what tends to attract attention, investment and innovation, leading new products to shove incumbents aside (see this). Looking at four major markets — China, Europe, Japan and North America — vehicle sales in the 12 months ending in June increased by about 1.15 million units, year over year. Of that, about 565,000 were electric vehicles. In other words, almost half the growth in the overall car market was taken by the plug-ins. That surge in the share of growth is, in part, a cyclical phenomenon. Growth in vehicle sales for these four markets was running at about 3 to 4 million a year in 2015 and 2016, but that slowed dramatically to an annual run rate of about 1.2 million since the start of 2017. Still, there’s no denying the growth rate for electric vehicles also played its part: For these four markets, sales in the 12 months ending June were more than double the total for 2016. Even at a normalized growth rate for the global vehicle market of 2.5 million units, electric vehicles’ share of that growth would still have shot up to 23 percent, all else equal. The driving force behind this is China, which accounts for slightly more than half of global electric vehicle sales. As I wrote here, China’s combination of high growth, intense competition and its need to address concerns around pollution and energy security is ideal. Again, vehicle sales also slowed there after 2016, helping to bump electric vehicles’ share of growth from single digits to more than 50 percent. Yet the absolute numbers show this is also a product of sales of electric vehicles simply taking off. Looking at the big picture is always a good idea. But in a transition, it’s the smaller picture that shows the way ahead.